Alpharetta, Ga., June 12, 2018 ---Solvay, a leading global supplier of specialty polymers, announced today that its Ixef® polyarylamide (PARA) resin delivered the high stiffness and biocompatibility that Reign Medical needed to develop its revolutionary new Clench® compression staple system, a single-use bone staple kit for orthopedic procedures targeting the hand and foot. Reign Medical’s innovative Clench® Staple System kit comprises a fully disposable sterile surgical tool set for fixating hand and foot bone fragments, osteotomy fixation and joint arthrodesis. Its design utilizes a patented threaded hub that allows surgeons to incrementally expand the implant for proper insertion, while retaining the mechanical properties of the Nitinol staples for continuous compression across the fusion site after implantation. The company specified Solvay’s Ixef® GS-1022 PARA, a 50-percent glass fiber-reinforced grade, for several components: the implant sizer, the drill guide and each part of the implant delivery instrument, including its handle, the saddle on which the staple sits, and the threaded compressor that forces the staples fully open. The mechanical strain on these components requires them to be molded from a very high-stiffness material, and Solvay’s Ixef® PARA GS-1022 compound proved to be the optimal solution. Offering metal-like strength, rigidity and dimensional stability, this biocompatible polymer also provides an exceptional surface finish. Available in a range of gamma-stabilized colors, Ixef® PARA is optimized for sterilization using high-energy gamma radiation, showing no significant change in appearance or performance after sterilization. The material has been evaluated for ISO 10993 limited duration biocompatibility and is supported by an FDA Master Access File. 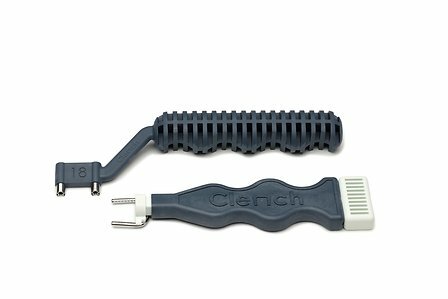 Reign Medical’s single-use Clench® Staple System received FDA clearance in early April this year. The company is now undergoing the beta test for its first production launch.